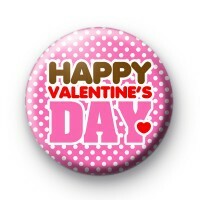 Why not wish friends, family & that special someone a Happy Valentine's Day with one of our cute love themed badges. This pink and white dotty badge has, Happy Valentines Day written in a bold font. It is a nice way to spread a little love and happiness and celebrate the international day of LOVE! So if you're feeling loved up or want to cheer up a friend and remind them that love Mr Right is out there make sure to take a look at our fun, sassy loved themed badges. We even have a few Anti-Valentine's and Galentine's badges.